Project Description: Transform chipboard and printable film from Grafix into an inspirational accent piece. Personalize with names, phrases, words and more! Stamp (using Frost White) and emboss (using White) three Black chipboard squares as follows: first square Flourish Background, second square Music Background, third square Old Letter Writing. Stamp (using Black) and emboss (using Black) three White chipboard squares as follows: first square Canvas Stripes, second square Lattice Background, third square Zig Zag. Print “CREATE” in font of choice, sized to approximately 1-1/2” to 1-3/4” tall, and spaced so that letters can be cut out in 2” squares, on Computer Grafix sheet. Let ink dry, and then cut out letters in 2” squares. Cut six 2”x2” squares from remaining White chipboard squares. One at a time, place 2”x2” White chipboard squares in Color Catcher and spritz each with a different color of Smooch Spritz; set aside to dry. Adhere letters to “Smooched” chipboard squares. Cut six 2-1/4”x 2-1/4” squares from Metallic Foil Board; mat “Smooched” squares on Metallic Foil Board squares. 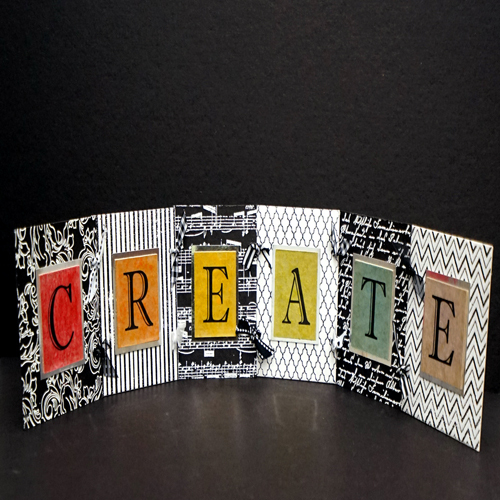 Adhere matted letter squares to centers of 4”x4” chipboard squares to spell “CREATE”. Mark and punch two holes on both sides of 4”x4” chipboard squares for “R”, first “E”, “A”, and “T”. Punch only right side of “C” and left side of second “E”. Cut ten 8” ribbon lengths. Thread ribbons through punched holes to tie letters together.